With summer around the corner we bring you summery fertility snacks and how to eat to beat infertility. We also look at the Two Week Wait and Secondary Infertility and checkin with our Fertility Journey couples includng Em & Julie's pregnancy news. 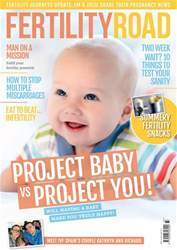 We look at Fertility tourism, the Top 5 Surrogacy Myths and helping your Man on his mission. Below is a selection of articles in Fertility Road Magazine UK Edition 38 May/June 2017.